Mark Lindner has inspired me to join on the latest meme despite not being tagged. As one who doesn’t tag others, shouldn’t I feel free to join in? I would rather blog than start packing for my trip to Las Vegas. I might be in real trouble, if I don’t get started soon. The good news is that I am doing laundry. I live within 10 miles of where I was born – and within 5 miles of where I grew up. I work within 4 miles of where I live. I’m a creature of habit – who sticks close to home and really enjoys my short commute to work. I was voted “Most Quiet” in the 9th grade. Fortunately, the students who ran our class government decided to use some “hipper” categories for our high school yearbook. As such, I’m not forever immortalized in our high school yearbook in this manner. It is good thing that junior high yearbooks seem make fewer reappearances. I don’t garden or do well with plants. In fact, I’m known for my ability to kill all house plants. 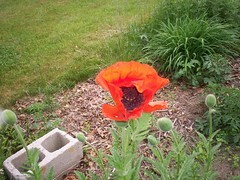 However, there is a beautiful, orange poppy plant in our yard. There is currently one flower on this poppy (see picture above). There are about 15 buds most of which look like they will bloom while I am away in Las Vegas – and I am bummed. I love this flower and look forward to its advent each spring. I wanted to study computer science in college, but was afraid of the math. I studied history instead. This is ironic because if you were to peruse my high school transcripts, math was the only subject in which I got high honors. Fortunately, I have learned to embrace the inner math geek inside of myself. Some of my coworkers (and husband) are amused by my love of Cross Sums. I almost always carry a copy of Dell’s Math Puzzles & Logic Problems with me. I can’t whistle – and can only snap the fingers on my left hand. I have a blue dot on the left side of my face right underneath my eye. My brother stabbed me with a pencil when he was 2 (and I was 4). I would have to have plastic surgery to remove it – and don’t feel compelled to go under the knife. I’ve had people that I didn’t really know try to wipe it off with their fingers. If you ever meet me, please don’t try and do that. Interestingly, I had to go look in the mirror to check what side of my face it was on. I own all episodes on DVD of Remington Steele, Alias, Silk Stalkings, and La Femme Nikita. I need to complete my sets of Buffy the Vampire Slayer, the X-Files, MI-5 (or Spooks) and Magnum PI. I hope someday that they release Scarecrow & Mrs. King. Bonus: This was much harder to do than I would have thought!!! Due to high volume of SPAM making it through Akismet’s SPAM filter of late, I have decided to moderate all comments from those who haven’t had an approved comment before. I would prefer commenting to be open to everyone with a real thought that they would like to voice. However, I can’t keep up with the SPAM. Hopefully, this move will help – and I won’t have to moderate all comments. Laura Cohen recently started a discussion about the place of academia in relation to online social spaces in a post entitled The Abdication of Community Spaces. In the post, Laura asks “Are any campuses hosting the kinds of spaces that can accommodate the immediacy of the need to create communities online?” She concludes that “institutions of higher education are abdicating their responsibility to host such communities.” Part of the inspiration for this post was the high number of communities that sprung up on Facebook after the April 16th shootings at Virginia Tech. One point that Laura makes is that by not hosting such communities itself, Virginia Tech has lost a vital piece of its social history in relation to the tragedy. Laura is also concerned that by abdicating their role in such spaces, academia will not be able to preserve important parts of its history. This is a great post with some excellent comments – all worth reading. I commented a couple of times – pretty much agreeing that I think it is problematic that academia isn’t jumping into the social network arena and sharing my reasons why. I’m coming at this from the viewpoint of a student in a distance program who believes that one of the biggest problems with online education is the lack of engaging communities that foster both social and educational interactions. I and many of the students in my program that I have been in contact with over the past couple of months feel the lack of social space quite keenly. I have discussed my frustrations with this previously. These frustrations led me to try and create some type of social space for students in the MLS program – particularly distance students. The only sustainable options at this point are to use 3rd party products like Facebook, Google Groups or Yahoo Groups. Honestly, I’m not happy with these products. They haven’t really done what I thought they would – or what I thought we needed. Undoubtedly, Facebook is the best option and the best product to facilitate social interaction. However, there have been several problems (mostly with email addresses and the way I created the group) have made the Facebook group less than ideal. I have come to the conclusion that academia needs to be participating in this arena in order to successfully fulfill the social component that is an important part of students’ educational experiences. Colleges and universities spend an inordinate amount of time and money to give students a sense of communities on their campuses. They really need to follow this through to the online arena – especially for distance students. As online education continues to flourish, I believe that it will be this type of attention to web-based communities that will attract students to one college over another. I know that if I were to even consider another online program, I would be much more vigilant about the services offered to distance students – something that I honestly never even thought to consider when choosing my MLS program. What Constitutes A Good Library Education? Earlier this week, Amy J. Kearns from Library Garden asked What are the library students of today learning? I have been mulling over the post and the accompanying comments all week – thinking about my own library education. I have questions: How do we define a good library education? How do we know if library students are learning what they need to know while in library school? What do current students need to know to be successful? How often do people meet recent graduates that are ill-equiped to take on the challenge of librarianship? Personally, I didn’t go to library school to learn about practical skills. I’m lucky enough to have learned these skills on the job. Honestly, I was much more interested in the foundations of librarianship – learning its history, reading about and researching important historical figures, discussing philosophical and ethical concerns and developing a sense of how my own beliefs affect what librarianship means to me. I can say that in my educational experience, SCSU has covered the foundations of librarianship extremely well. In fact, I have been happiest with the classes that covered these topics. I am developing my own sense of what it means to be a librarian and what librarianship means to me. It is important to note that customer service is included with the foundations of librarianship. The primary importance of the patron and their information needs and desires is something that has been stressed in almost every class that I have taken. I would include cataloging basics (MARC & AACR2) and reference basics in the foundations category. So, the basic building blocks have been covered. What have I learned beyond that? I have been taking as many management classes (and classes relating to academic libraries) as possible. These classes have focused on managing resources – including people. I sometimes find these classes painful because so many of the case studies and discussions reflect my real world experiences. However, they are vital classes – and I think they are making me more confident about my ability to make managerial decisions (I do have a job where I manage a department). One of my least favorite assignments was an “in-basket” exercise where we (the students) took the role of library directors and had to deal with a number of issues – personnel, budget, temperature wars, etc. – in our in basket within a tight time frame. The crux of the assignment was to identify which problems needed to be dealt with immediately, which ones could be delegated and which ones could wait. It was painful, but was a wonderful learning experience – in a safe, controlled environment. I think it is one of the best assignments that I have been given thus far. What about technology? In the aforementioned post by Amy J. Kearns, she wonders whether students are learning about Web 2.0 technologies. There is an interesting quote in the Kearns’ post from another library blogger. … And maybe you’re right about needing to educate our professors. I think they also fall into the three categories: those in the know, those who want to be in the know, and those who think it’s relevant/unimportant or are unenlightened. Kathleen Houlihan from LibraryNation makes an important point about the divergent nature of technological skills among library students – which doesn’t necessarily have anything to do with the wide range in age for MLS students. There is a significant percentage of library students who don’t have a decent comfort level with technology itself when starting their program – which oddly enough mirrors my experience with people who work in libraries. I strongly suspect the same can be said of LIS faculty – some are technologically savvy, some would like to be and some don’t care to be. For the students, many need help and guidance with the basics: email, the internet, computers, etc. Web 2.0? So many students are not ready for that during their program – not even close. In my time in library school so far, we haven’t talked about Web 2.0 or about Library 2.0 in any specific capacity. We have used some Web 2.0 technologies – wikis, blogs, chat rooms, etc. In each instance, however, there were students who were very uncomfortable using these tools. Anything significant that I have learned about these subjects has been self-taught – and is part of my process of keeping current and learning about what is new in the profession. I can’t say whether the faculty know about they technologies or not. I suspect that most do know about them, but have specific agendas for their classes – and many times Web 2.0 technologies do not fit. Technology is a big problem – one that I don’t think we have dealt with successfully in the work environment never mind in the education environment. Everyone who works in library-related fields needs to be technologically competent. It isn’t going away. We will only continue to become more dependent on systems, on the internet, on computers and portable devices. With new operating systems that continue to lock down computers and impose stricter restrictions to fight spyware, viruses and intrusion, people need to know how their computers work – and how to configure them. I am concerned about how we teach this to people. We do not do a good job of it. This isn’t something that happens at library school. I am in no way saying that we shouldn’t be learning about Web 2.0 technologies in library school. I’m just saying that we can’t really teach them to students who don’t have basic computer skills. Personally, I’m a proponent of learning about Web 2.0 by doing. Not only does this help one learn about new technologies, it can help students be more comfortable in a computer environment. The answer to how library schools could teach this stuff is by engaging in it. Follow the lead of LIS faculty like Michael Stephens (see http://lis753.wordpress.com/) and Amanda Etches-Johnson (see http://lis757.blogwithoutalibrary.net/). Both of these people are putting their classes online in a variety of ways – interspersing Web 2.0 technologies into the learning environment. LIS schools could make, sponsor or encourage students to create and participate in social networks. Education has social components that fit in nicely with Web 2.0. In the end, it is difficult to know what constitutes a good library education. There are many variables – students come into programs with different levels of knowledge, they have divergent expectations, there are different educational tracks for academics, special librarians, archivists and school media specialists, faculty teach differently and have different experiences, etc. No two people get the same education from the same professor never-mind the same school. So far, I’m fine with my library education. Remember earlier (yes, this is a massively long post, I know) when I wrote that my educational experience is about developing my own sense of what it means to be a librarian and what librarianship means to me? I have taken it upon myself to make that my goal. Library school is helping me achieve this, and in that vein, I would have to say that my experience has been enriching, challenging and in line with my expectations. Could library education be improved? Of course, it could. I think there is significant room for updates to the curriculum and other improvements. But, there is already a solid foundation to library education. It could just use some sprucing up! I have just booked a helicopter tour of the Grand Canyon for next week. I would call it a joint anniversary gift (today is actually our 7th wedding anniversary – how quickly time flies UPDATE: it flies even faster since it is our 8th anniversary), but my husband – who is not a good flier – isn’t entirely sure he plans to go. Since we are going on vacation with my parents, my mother may end up going in his place. As one who loves to fly, I’m looking forward to my first trip in a helicopter – and more importantly, the Grand Canyon itself. I decided on one of the trips with a descent into the canyon. I am thinking this will be the highlight of the vacation (for me at least). I can hardly wait!!! In addition, we are also going to see Cirque du Soleil – the “O” Show, I think. I was very wishy washy about going to see a show. We – meaning my husband, my mom, my dad and myself – dragged our feet, went back and forth about what we wanted to see. I’m not opposed to Celine Dion, but not in a hurry to spend lots of money to see her – and I doubt I could drag my husband. Fortunately, everyone seemed intrigued by Cirque du Soleil. The amount of SPAM that is making it through WordPress’ SPAM filter is on the rise – exponentially. Over the past week, I have had to delete between 30 and 50 comments or trackbacks about 4 times. ARGH!!!!! The SPAM filter is also catching much more. It seems as if every-time I log on, there are over 200 comments in the SPAM queue. Sadly, I’m not going through them all to check for false positives – it just takes way too much time. On that note, I will mention that I won’t be deleting any SPAM that makes it through – or responding to comments or questions either – next week. I am on my way to Las Vegas on Saturday, June 2nd. I will be back late on Friday, June 8th. I do not plan on spending much time online – I’m hoping not to take my laptop. Hope springs eternal! It begs the question—what’s the point? Is it a status thing to have lots of friends? Or particular friends? Am I more important because Stephen Abram is my friend on these networks? Am I the only one feeling the weight and noticing the dilution of our social networks? Something tells me I’m not the only one. I’m curious about how other people deal with this. Do you add everyone who adds you regardless of whether or not you know them? Do you add people you don’t know? If someone doesn’t add you, does it hurt your feelings? Do you think the term “friend” in these social networks has meaning if you add people you don’t know at all? There are some great comments on this post – all worth reading with people offering some varying viewpoints. The whole friend thing is very strange. Friending people is obviously a large part of many social networks. Due to my rather introverted nature, I’m not one to send friend requests – in fact, I think that I have only invited 3 or 4 people to be my friend. On the other hand, I have had a good number of requests for friendship by others. So far, I have accepted every request – not feeling as if I had any valid reason for saying no. However, I will admit that I have wondered on several occasions who some of these people were – and why they were asking me to be their friend. On some networks – like Ning – the concept of friendship doesn’t appear to add any significant value to the whole experience. So, what is friendship for? What does it actually mean? When is it appropriate to send a friend request? Should you give someone a reason when you ask them to be your friend? What does it mean to be friends with someone? What are people’s expectations for the relationship? Am I more important than you if I have more friends than you do? More importantly, do I have to do anything to nurture the relationship if I say yes to your friend request? Obviously, the use of the term “friend” is part of the problem. In one of the comments on Meredith Farkas’ post, Phil Bradley writes that he has “done a mental global delete with ‘friend’ and replaced with ‘potential contact’.” This makes a great deal of sense to me. I generally don’t use any social networks to keep in touch with my real friends – all of my online presences are related to my professional interests or my school experience. I think that I may well follow Bradley’s lead on this one. Viewing friends as potential contacts helps me to understand why others may have asked me to be their friends – and makes guilt less of a problem overall. On the whole, I’m at the point where I find social networks very tiring. They are high maintenance and incredibly time consuming. I’m not saying that this negates their value. I’m just saying that I have already become apathetic to many of the social networks that I have joined. In some cases, there is so much going on that if I do not log in several times a day, I feel like I’ve missed so much. I don’t think -ok, I know that I have the time to keep up with them. RSS feeds help – and this is how I read stay current with what is going on with many sites. However, using RSS feeds somewhat defeats the purpose of many networking sites. So really, I have no idea if you are my friend or if I am yours. I have no idea of what it all really means, but I will continue to accept all friend requests. I’m not sure how big of a part I will ever play in social networking sites. I suppose that I will get more comfortable with them over time. I need to be better at networking all around, so I suppose I’ll just have to put more effort into it. You are currently browsing the Life as I Know It blog archives for May, 2007.